Wishing all of our readers a happy, healthy and prosperous Chinese New Year in this The Year of the Monkey or as we here at DT like to think of it – The Year of the Darts Monkey! Hopefully the year of the darts monkey will bring our darts players a bit more skillful arrow accuracy – as we all know some (no names mentioned) that couldn’t possibly do any worse. I’ll give you a bit of an overview of what we here at DT hope to accomplish in this coming year. This past year was a conversion of the entire website which was well overdue. Recently included was the re-addition of our featured darter now called our “Darts Darling” which was no doubt our most popular photo gallery article in years past. Plans are already set for photo shoots from various darts bars of more Thai darts beauties. It’s truly amazing the number of the number of guys willing to offer our photographer Johnny any assistance possible when he has a “Darts Darling” photo shoot set up – pure selfless giving of time and effort all in the name of promoting our beloved game or “sport” of darts! Another way overdue update is to our darts venue listing page. Regretfully none have been jumping at the bit to update this as so many – way too many – former Bangkok darts bars no longer exist. But we will accomplish this update with a more comprehensive listing. 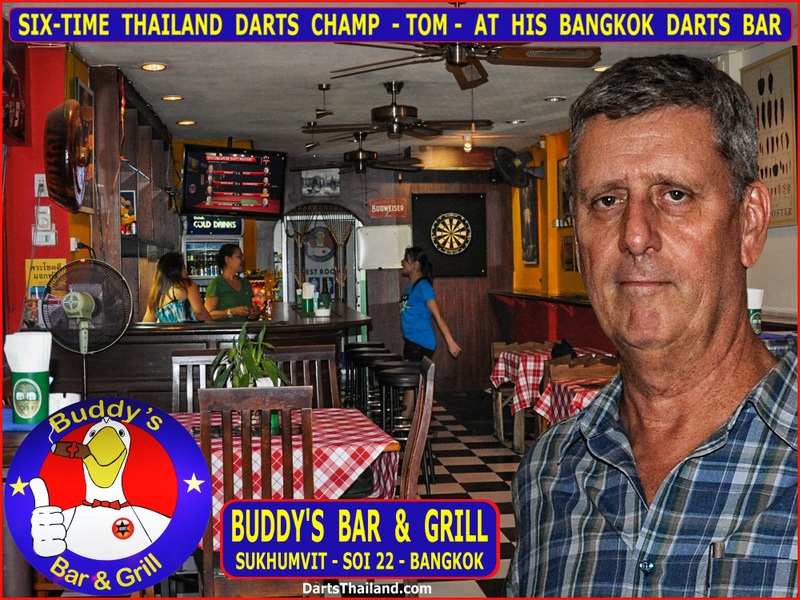 The good news is that the more active Bangkok darts bars hold weekly events. The long-time popular Domino Pub have not only one but two weekly events – Wednesday & Saturday night Lucky Draws. Back with regular Thursday Lucky Draws is The Sportsman. And the Darts Club at New Cowboy Bar have a doubles draw on Friday nights and usually again on Sunday nights. I’m sure that regular players from all these venues are happy with the increase of visiting players. Always great to meet new players from around Thailand and the world visiting Bangkok. The major Bangkok annual Open events are run by the utility companies EGAT & PEA power companies and happy to see MWA (Metropolitan Waterworks Authority) join in with their first open – tomorrow and Sunday (30 – 31 Jan). Good luck to all the participants ! Another major event is the Korat Open run by DPAT (Dart Players Association of Thailand) who also run the regular events called “The One” out of the Chonburi Darts Club. As we learn the dates of these events we will post them. One of our major goals here at DT is to publish information about where the darts action is happening. Coming to our attention with more darts events are Jungle Juice Bar in Huahin run by our good friend the lovely Miss Oil. And out of Phuket – Starfish Bar run by Rod and his lovely wife. Stay tuned because we plan on featured articles with more information of these two venues along with others that dart players should know about. Last but certainly not least is my New Cowboy Bar Darts Club Update. 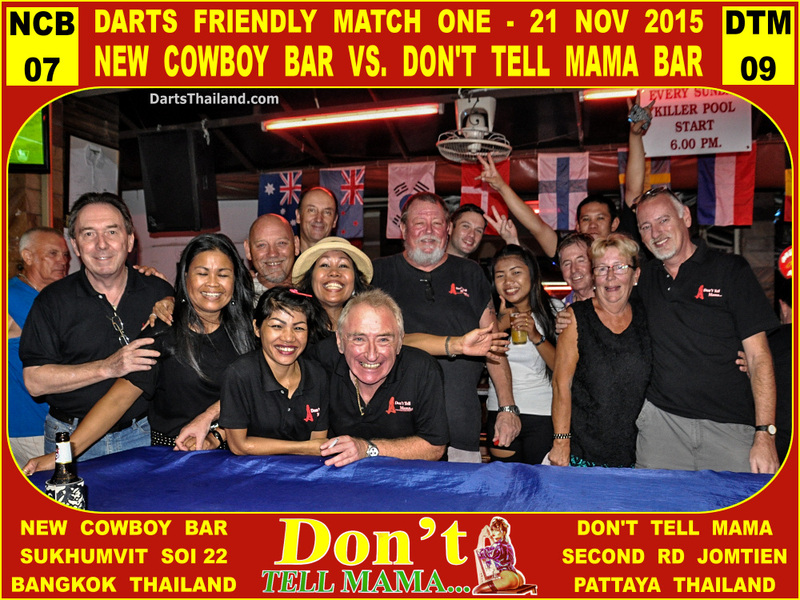 It was our great pleasure to meet Captain Steen and his team of great folks playing out of Don’t Tell Mama Bar in Jomtien last year with a friendly challenge match – 1st round in Jomtien. We now have a date for the 2nd round – Saturday 20 Feb at NCB in Bangkok. We’re all looking forward to this event. If you find yourself in the Pattaya /Jomtien area – be sure and make a point of calling into the Don’t Tell Mama Bar – you’ll be happy you did. Some pics from our 1st round are in the following gallery. And we have another NCB friendly challenge match against Buddy’s Bar and Grill also located on Sukhumvit Soi 22. 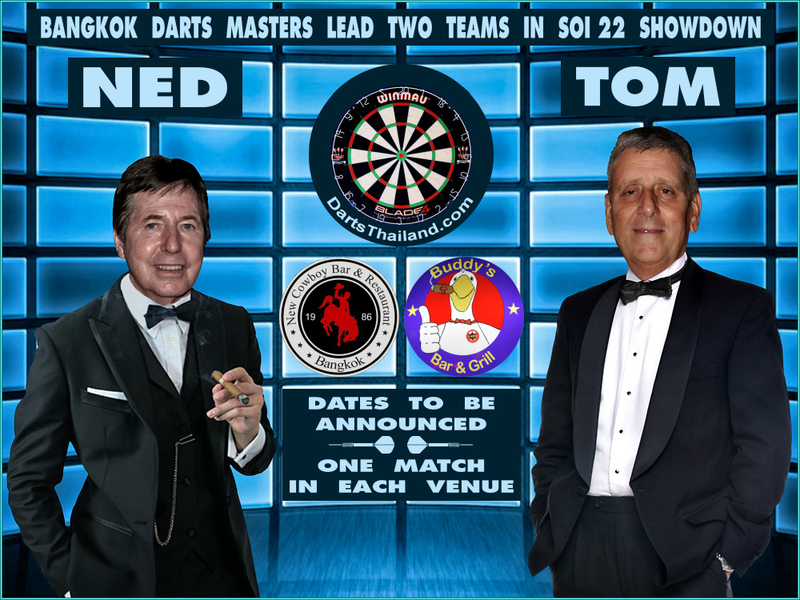 The two teams will be captained by long-time friends and darts adversaries – renowned Bangkok dart pros Tom and his Buddy’s Bar Team and Ned of the once popular Silver Dollar Bar (now gone) will be leading the New Cowboy Team. Ned now serves as the in-house darts pro in Moonshine Place Guest House – Soi 04 in Jomtien. Stay tuned – one match in each venue and we hope to have the first date set soon – very soon.